Ledgestone TD Nate Heinold is happy to announce the 2018 projected AM payout. The projected payouts for 2018 represent an increase over the 2017 payouts. The total projected AM payout would be just over $67,000 assuming a full field of players. This would be on top of the massive AM player packs that have become famous at the event. The Ledgestone is unique in that it includes large AM player packs with the largest AM payouts in the country. Discraft will continue to provide the payout and will have a very large selection of items on hand including discs, baskets, apparel, etc. In addition, we will once again allow AM vouchers to be used online through the Discraft order form if someone isn’t able to purchase their items at the event. First prize in MA1 this year will be $1,000, enough to take home about 65 discs if the winner chose to just take discs. Payouts will be strong and deep, with 50% of the field being paid out in MA1 and 45% of the field being paid out in MA2 and MA3. Over 75% of the field will be paid out in the Female AM divisions. The depth of the payout will be incredible, with the top 37 competitors in MA3 taking home at least $200 in merchandise money. In MA2, the top 38 competitors will take home at least $200 in merchandise money. The MA1 payout will be more top heavy, with everyone in the top 4 taking home at least $550 in merchandise money. It was not uncommon to see people walk away from last year’s payout with stacks of discs. The baskets went quickly last year, as did the Grip bags. Discraft will have some unique items available for sale again this year. 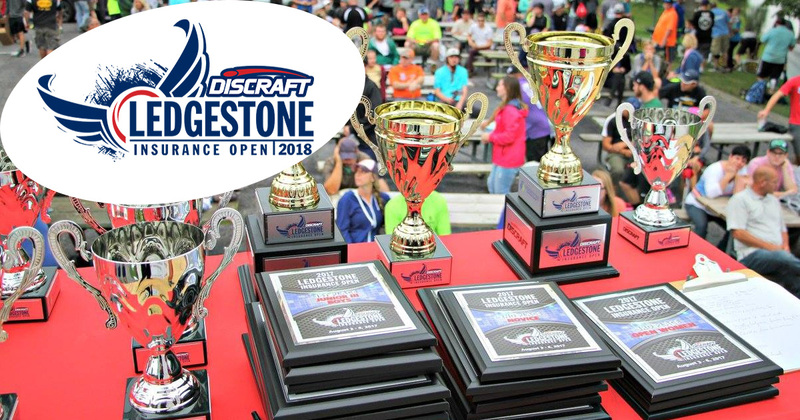 The 2018 Discraft Ledgestone Insurance Open will take place August 9th through the 12, with the AMS playing the 10th through the 12th. Registration will take place exclusively at Disc Golf Scene. Registration begins 2/1 for hole sponsors and 3/14/18 at 6PM CST for all AM players.